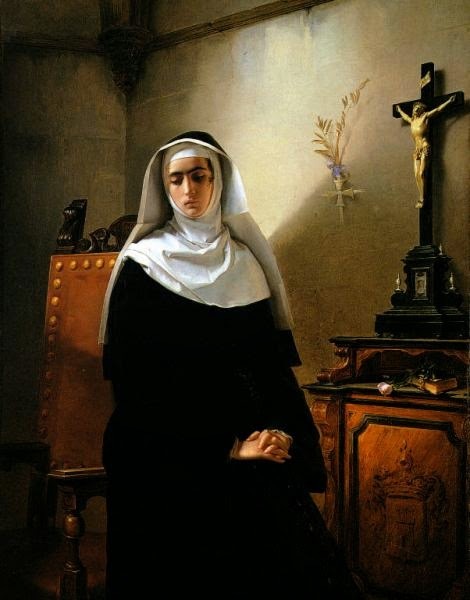 Monza's nun, Giuseppe Molteni, 1847, Museum of Pavia. Henrietta Caracciolo was born on February 17 th in 1821. Her life was an extraordinary life that seems to be a novel, one of those written by some her contemporary to denounce and exemplify the status of women but, on the other hand, does not take a cue from an emblematic example but from her life, her biography, a life story lived on the skin, like that of many heroines, and this word was never more fitting if not for her. She born in Naples by Don Fabio Caracciolo, son of the Prince of Forino, Marshal of the Neapolitan army, and by the noblewoman Teresa Cutelli, in one of the "first and most substantial families of Naples" . She lived a fairly quiet existence between Bari , Naples and Reggio Calabria, apart from a break of a few years when her father loss his job. When her beloved father dies of infection to internal organs, her mother wishes to remarry, so started the procedure to let Henrietta to get in the convent, without she was aware of it. It implements what a "forced" nun a few centuries before, the Tarabotti, identifies as the greatest betrayal, that of ones parents. Henrietta seeks shelter from the maternal decision and despairing and crying she obtened from her mother the promise that she will stay in the convent only a few months and then could come back to home. Henrietta undergoes what the society had as an ordinary habit worn on the skin of women, in fact her older sisters were married but she, with two love gone wrong and no dowry after the death of her father, will be the only one to be, the fifth of seven daughters, a forced nun, even the malformed Josephine, now lame after a disastrous fall, will get married. Henrietta is the victim of a practice that in theory was already condemned by the Counter-Reformation of the sixteenth century but that in the practice had not actually had any effect on the much more established habits in use in the culture of the society of pre-Italic demonstrating a unified habit of costume even before the unified process of Italy as a nation. So in 1841, Henriette takes her final vows and finds herself unwillingly nun but if "I had made to the community the sacrifice of my person not already one of my reason, which is an inalienable right"  now "dead is the past, extinct the future for me, and memories are just a vain dream, and hopes a crime "" it was supposed for me not to have a mother, neither sisters, no relatives, no friends, no whatsoever substance; I had abdicated even my personality". Monza's nun, Mosé Bianchi, 1867, Museum of Monza. The first impact in the convent was of the worst, she educated and lover of the arts and literature, finding herself to live in claustration, with rough, uncultivated, semi-illiterate nuns: "most of them are young, or at least not old, and all, as I said, belonging to the most significant, if not always the richest, families of the former capital. Her existence, we said it, seems like a novel, and so even Henriette, like any self-respecting heroine, had her bad: the archbishop of Naples, Riario Sforza, to which she devotes an entire chapter, the seventeenth, of her Memoirs. With the election of Pope Pius IX, Henrietta thought to have a glimmer of hope in solving her condition, asking for clemency directly to the Pope who did not seem contrary to her demands except that the archbishop of Naples, Riario Sforza would not release the authorization that would allow Henrietta to start a new life, even in contravention of papal preferences. During the riots of '48, for the independence of Italy, Enricchetta takes courage and start to read, even in a loud voice in the convent, "revolutionary" newspapers, careless of the fame that is given to her of being involved in secret societies and a revolutionary. She appeals once again to the Pope for her freedom, informing him that otherwise she would have taken advantage of the freedom of the press to publicize her condition of forced nun. So the Pope gave her the authorization to go to a conservatory, of Constantinople, but the archbishop Sforza, becoming aware of his defeat, forces her to leave at the convent her family assets, and the precious silverware. At the Conservatory of Constantinople, the nun found an environment that isn’t open and conciliatory, and in which she had to abandon all hope of being able to cultivate her readings and so she had to concentrate herself exclusively on the biographies of the saints and martyrs of the Church, discovering how the female figures had contributed, revealing those fundamental but also the lack of an official acknowledgment by the Church about this importance. Enrichetta Caracciolo as in the cover of Her "Memories"
Meanwhile, the archbishop Sforza continuing his fight against Henrietta and he succeed to intercept some of her writings that she was able to put them out of the Conservatory with the complacency of a housekeeper. These writings were brought to the Pope to convince him not to give in to the rending demands of Henrietta and of her mother, who divorced in the meanwhile by her second husband and now was repentant of the injustice suffered by Enrichetta. Only in 1849 Henrietta finally was able to get out of the conservatory to be treated to the nerves, with her mother, but the permission for the following year was denied by the archbishop, Vicar of Naples, Riario Sforza. At this point, the mother of Henrietta, Teresa, applied herself to "save" her daughter making her escape and take her refuge in Capua under the protection of its bishop who however died only a few days later but with the help of a friend, a priest too, Henriette had the allowed to go and live with her mother, just following the rule of the Canonichesse of St. Anne. She was even managed to take back the income of her monk dowry who had seized by Riario Sforza, making her live exclusively thanks to her parental help and support. In 1851, the archbishop, strong of his influence on Ferdinand II, arrested Harietta and led her to the Church of Saint Mary full of Grace in Mondragone where Henrietta attempted suicide, first by refusing food, and then stabbing herself in the chest. Because of her weakness due to the lack of nutrition, however, her injury was not enough to take her to death, and so she survived for an entire year resisting the seclusion, but when she was even prevented to go to the bedside of her dying mother, aided by relatives and aunts, she turned once again to the Curia for help. She appealed in fact to the Sacred Congregation for to have a permission to go to Castellammare Bath for health care. This time she went through it, in fact, now even the Curia was annoyed by the persecution, to this point clearly personal, of the Riario against Caracciolo and it was able to find a basic misunderstanding in the archbishop’s letter to consent Henrietta to treatment herself. In the meanwhile she was back to Naples in disguise, to help the willing of the unifying Italy: "What did I do in Castellammare in the while? [...] Thinking, then, that you would found a little place for my contribution in Naples, I thought of disregarding of all danger for me, as I could offer my services to the movement which need them "[9 ]. She hidden herself, changing home and service staff as you change the tablecloth to escape the spies of the Bourbons and of her historic enemy who was waiting his revenge, the archbishop Sforza. The Cloister of San Gregorio Armeno's Church in Naples. By now she was really in touch with the Liberals and with the fathers of united Italy. So in 1860, during the Te Deum to celebrate the escape of King Francis II of the Two Sicilies, in the presence of Garibaldi "[...] I left the black veil from the head, and put it on an altar, I made a note of restitution to the Church, which had given me it twenty years ago. VOTUM FECI, GRATIAM ACCEPI " (I took votes, and now I take my mercy) . Thus began a new life for Henrietta, her true life, but no less adventurous and fascinating. She married John Greuther, choosing the Protestant rite after the denial of the Catholic Church, and she begins to tell, thanks to the press, her extraordinary existence scratched by the monastic vows. In 1864 it will be the turn of her first opera, her memoirs that were translated in six languages​​: English, French, German, Spanish, Hungarian and Greek and had a resounding success even in Italy with no less than eight reprints, which also earned her the praises of Manzoni and Garibaldi. Two years later, in 1866, It is her second book "A crime unpunished: the historical fact of 1838" in which she recounts the murder of a schoolgirl by the priest who the girl had rejected. She wrote over the years: "Miracles" in 1874, a collection of poems against superstition, and the drama "The Strength of Honor," which was also represented in theatres. In 1883, a drama in five acts "A episode of Mysteries of the Neapolitan Cloister ", based on her memoirs, was published. She wrote also numerous articles as correspondent for the newspaper " La tribune" of Salerno," the journal of Naples "and" the Nomad" of Palermo. 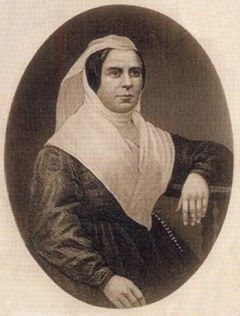 She was a prominent member of several associations including the “Banner of the Charity”, the “Association of the youth studious of Naples”, the “Society for the Emancipation of Women” of Lorino, so that in 1866 on the occasion of the motions of the Third War of the Italian Independence she appealed directly to women, by publishing the "Proclamation to the Italian Woman" for mobilizing women to the national cause. Her support to the Italian politic will be always broad and unconditional, supporting, through the Committee of the Neapolitan female, with her sister Giulia Cigola, the bill of Salvatore Morelli, in 1867 "For the legal reintegration of women" in which he asked participation in the political and administrative vote for women, a bill which, however, was not even allowed to read. Unfortunately, , despite Henrietta had mobilized and dedicated herself to the cause of Italy, she didn’t receive recognitions, in fact, Garibaldi left Naples to go to Capri, before signing a decree by which he wanted to appoint Henrietta inspector of schools of Naples and the same did the Minister of the education, De Sanctis, who even if had promised her a job, then disowned her. So as usual the history of women, unluckily as we know, is another thing from the History. So Henrietta lived the last years of her life in her hometown, now a widow and without her family's assets that the archbishop Sforza had kidnapped and that was never found, forgotten by her people but at least finally free. But we love remember her, like she would: "[...] And the name of Citizen, which gave to everyone does not contain any distinction, it became to me the right and only title [...]. [...] Citizen so call me, and if you want to add a distinction just say that citizen who provoked and promoted the Plebiscito of women in Naples ". And in Naples, in her city, she died in March on 17th, in 1901, aged 80. Mysteries of the Neapolitan Cloister: Italian version, as the original.